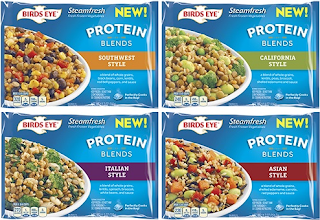 I recently tried out a new frozen food mix by Birds Eye brand. It is a new series called Protein Blends that include a mix of different ingredients that can be microwaved in the pouch. There are 4 varieties: Southwest, Asian, California, and Italian style. So far I have tried the Southwest and Asian styles. The Southwest Style is very good! It has a mix of black beans, lentils, corn, rice, pasta, and peppers. It is easily prepared in the microwave in minutes. I find it has enough for at least 2 servings. The cost is very reasonable as well at about $2.25 for the pack. I usually add a little olive oil to the mix after it is heated. I also decided to try out the Asian Style mix. This one I did not like as much. It has a mix of grains, edamame, carrots, and peppers. I found it had a strong flavor that I just did not like very much. I would not get this one again, but I will continue to get the Southwest Style. If you are looking for a nutritious and affordable easy to make meal, I recommend checking out the Birds Eye brand Protein Blends!